Castel Gandolfo is located 25 km away from Rome, specifically south west of Rome. It’s a village located right on Albano lake and it’s famous because it’s the Pope summertime residence. The Barberini garden has been open to the public only since March 2014. Even more recent is the opening of Palazzo apostolico (October 2016). Therefore these are somewhat new experiences for us romans as well. Apostolic Palace. Up until the end of October 2016, the visit to Apostolic Palace didn’t feature free access to the whole papal residency but only to six rooms on the first floor. So only the expository space that features 51 portraits of Popes, liturgical clothes, outfits, Pio IX’s renovated gestatorial chair as well as the throne used for 80 years in the Sala of Consistory. Starting October 22nd you can visit the Swissmen hall, the Throne room and the Consistory room as well as more private space reserved to the Pope such as the library, the private study, the office of the secretaries of the Pope. A nice treat is the chance to visit the Pope bedroom. The bedroom is famous because that’s where Papa Pacelli hid some pregnant women in 1944 during the World War. And also you can visit the private chapel where, for the first time, two Popes prayed together. That is Benedict XVI and Pope Francesco. The gardens. There are three ways to tour the Barberini garden at Castel Gandolfo: by foot, a 2 hour guided tour; boarding an eco-friendly small train, 1 hour tour and dedicated audioguide; boarding an open bus, 40 minute tour and multilngual audio guide. The offers change costantly so you may want to check out the Vatican Museums site for all the available options. It’s useful to know that the garden doesn’t have an internal parking lot or a wardrobe service. Access for animals is forbidden. And during the tour only small backpacks are allowed inside. Furthermore you can’t eat food inside. Appropriate dressing. The dressing rules for Barberini Garden and the Palazzo apostolico are the same that you must follow at St.Peter’s. Therefore it’s forbidden to access the area with uncovered arms and legs. So you need to wear a skirt or pants under the knees and you have to cover your shoulder. We recommend you to wear comfy shoes.. Disable people. Unfortunately the tour to Barberini garden is not accessible for people on wheelchairs or people that have trouble moving around. No refund. Reservations are not refundable. Rather than reccommend what to bring, we’re better off listing what’s not allowed in the papal villa. Since there’s no wardrobe service you can’t bring suitcases, handbags, boxes or any type of container. Only small size backpacks are allowed that must be carried on your shoulders and “don’t stick out of your body volume for more than 15 cm”. You can’t bring medium or large umbrellas, walking canes (unless it’s for a disable person), tripods for cameras or videocameras. Only small size umbrellas are permitted inside. During the tour you can’t eat food and you can bring only plastic bottles. Opening times vary according to the type of tour you wish to take. Tickets and packages constantly change. There are several ways to tour the Barberini garden and the Palazzo apostolico. Since the tour modes and packages prices vary constantly, we recommend you to look up the updated fees on the Vatican Museums website. Buy tickets online. You can book your tickets on the Vatican online box office. To do this you need to provide an ID, a credit card and the names of all the people taking the tour. Discounts are available for youngsters aged between 6 and 18, and students up to 25 years old that must provide the International Student Card. There are also packages available for groups, families and pilgrims. Trenitalia and Vatican railways. 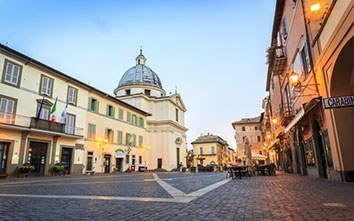 There are two ways to get to Castel Gandolfo: one is with Trenitalia, from Termini station to Castel Gandolfo. The cost is 2,10 Euros. The other way is with Vatican’s eletric train that leaves from Roma San Pietro FS station. The cost is included in the Vatican packages. The packages feature a break of 4 hours at the end of the tour. You should take this into account when planning your tour especially if guided.